Ben is really excited about being in Aialik Bay Public Use Cabin, about his dehydrated veggies, about the classy candle holders, and about his clean teeth. Contrary to popular belief, Ben cannot see through his eyelids, not even when he’s looking at the glaciers in Aialik Bay. At the end of the week in Alaska, Ben and I spent several days at the Aialik Bay Public Use Cabin. 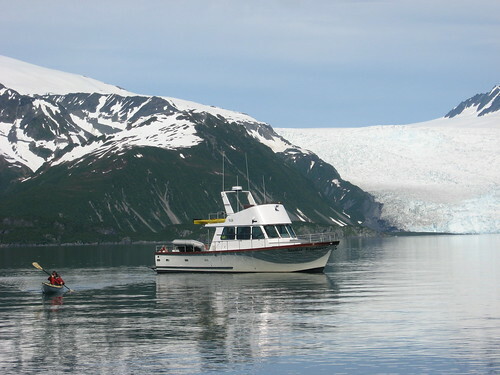 When I lived in Alaska, we never did touristy things like go out to the wilderness or go on boat trips. Anything we did along those lines was generally school related. We rarely even went hiking (but that’s a story for another post). So it was a bit of a surprise when Ben explained that his plans for part of our trip involved going to a cabin for two days. The cabin is a three to four hour boat ride from Seward. It has no electricity or running water. So when Ben said that, I started worrying. This is a place where you are advised to bring an extra four days of food and supplies because if a storm comes in you could be stranded. This has never been my idea of fun. Then I realized that the main thing that people did in Aialik Bay was kayak. Also not my favorite activity. The last (and only) time I went kayaking was in Montreal in 2003. I went to a kayaking class through the youth hostel. The kayaking was down on the canal. At some point I managed to flip the kayak and as I was leaving the class I had severe pain in my ear. I ended up at the doctor. It turns out that the pressure of the water against my eardrum was dangerously high. Could have burst it. So, anyways, my memories of kayaking weren’t ideal. Ben had never been kayaking, but in part persuaded by my mom, I decided to go along with the kayaking idea. Because double sea kayaks are more stable than singles, we rented a double for our trip. In the above picture, Ben had just brought the raft we brought our stuff to the beach in back to the boat and is heading back to the cabin. In weather like this, though, it was hard to not love kayaking. It was warm and dry enough so that we didn’t freeze after climbing into the kayak in bare feet via the ocean. Having two paddlers meant one of us (me) could take a break while the other ensured we didn’t end up on shore or in front of a glacier. Plus I loved kayaking because it was not on land. Land was where the bears were and to be honest, I wanted to stay as far as possible from the bears. But that’s another story.